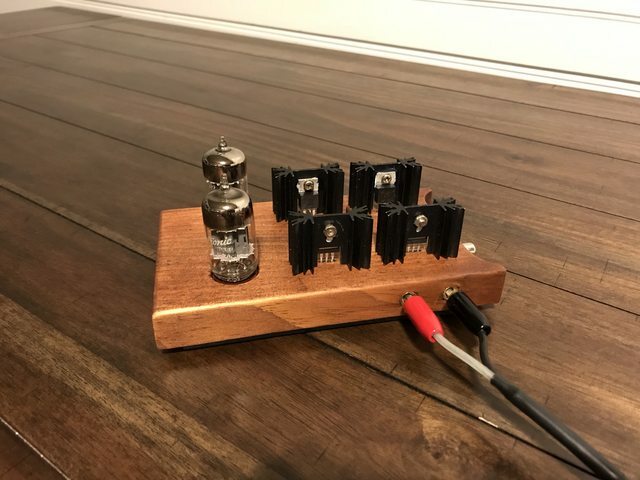 I also built this amp using a pcb I found on e-Bay. PSU is regulated 12.6V with a LM317 followed by a TPS7a4700. Sounds great - better than expected and I'm happy. To answer the questions: This amp with B+ at 12V by my calculation (which may be wrong) produces 0.5W max. This means that if you have pretty sensitive speakers (let's say 90dB/W/m), this amp can drive them at 45dB level (0.5*90=45). In real life in the evening when everything gets peaceful and quiet, you could probably try it and play at easy-listening level. Now I'll have to try it to see how it works. So I decided to built this amp the other day and I really liked the sound. Yesterday I built a little plinth for it and and decided to use a 24v 2.4A regulated power supply I had laying around. 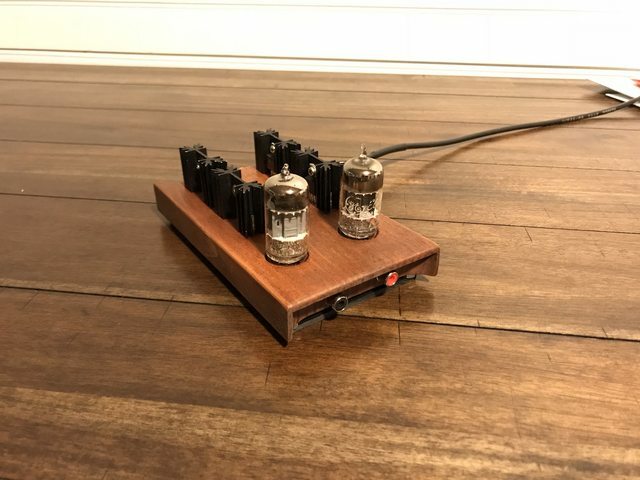 I wanted the look of 2 tubes so I used a triode from each tube and ran the heaters in series. Everything else is per the original schematic with 2.2uf metalized poly film on the input. simple point to point wiring. I've been listening to it as a line level to my HiFi system. No noise, soft highs, I'm really surprised at how good it sounds. Does anyone have the schematics and pictures or layouts of the amp version that koogar (Rupert Hirst) made that had a power supply and a power on delay built in? I don't have exactly what you're looking for, but this is what I built 2 years ago. I used a Cannon K30120 13v 1.8A portable printer power supply as suggested. An effort to get it out of it's plastic case, but worth it. I found a basic circuit schematic with a 555 timer and a relay to switch in the headphones or speakers a couple of seconds after powering on the amp. When I only used this amp with headphones the on/off "pop" didn't bother me. I just made sure I didn't have the headphones on when turning the amp on or off. It was only when I decided to run a pair of speakers that it bothered me. Have you looked into the amb labs e12 delay? Made mine some time ago, works great . Volume, usb dac , amp and 12v dc/dc isolated converter..Fets and lm317s cooled by aluminiumcase. Shoelace covered cables on volume unit for pro look Extra red led.under tube. Nice set up. I use a little Fiio DAC with mine. Like your little cage over the tube. Putting this together and could use your clarifications with a couple of things... First and foremost, the size of the PCB from the original post is a little confusing ("After many modifications the PCB was reduced to a 2-1/4" x 4-3/4" and then down to 2" x 4" (50 x 100 mm) with thicker traces. The build is demonstrated on the first version (slightly larger PCB)."). What is the actual size of the PCB in that PDF? If I print it "actual size" (letterhead paper size, though that shouldn't matter) I'm not getting either of the sizes above, but 1.75" by 3.75". Which one is it? In terms of parts choices, I opted for the IRF610 due to lower capacitances, which I trust should translate in potentially better frequency response (than in the case of the IRF510). Thoughts? Also, thinking of doing this with an 6189 from TD (didn't have any 12AU7s laying around...). Though have not gotten this up and running, so I don't know if this is necessary, but I may be very interested in exploring a more fully fleshed B+ (I don't mind putting together an actual PS for this). In that case, I wonder what an optimal B+ would be (all things factored in, such as power dissipation on all other parts also). 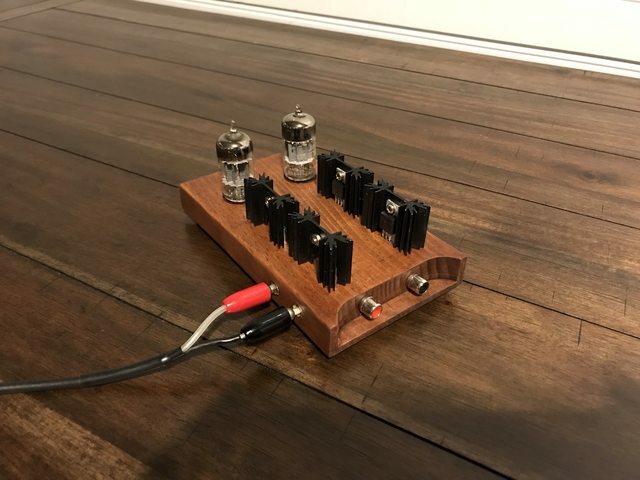 Does anyone have any direct experience / thoughts on this amp and Pete Millett's Nutube-based amp? I have that other one built and have pretty conflicted feelings on it. I'd be curious of some A/B thoughts. Looking forward to the project! Thank you all for your input on this. I sorted my PCB issue by downloading the board file and running it in Eagle. For anyone else's reference (possibly needing this at some point in the future), it's 3.75" by 1.75". Built it, adjusted bias (no issues whatsoever), and I'm pretty stunned by the performance. It's one of a few recent headphone amp projects (and trials of factory-built stuff) and this is a damn good one. Not expected. Also, drives my HE400is (difficult load in the low impedance world at 93dB) without losing a beat, very effortlessly. I also expected the low B+ to tax the performance a lot more, I don't really feel it does. Impressed and very happy.